The forecast was for powder. But I clearly wasn’t the only one who’d seen the news. Outside my truck, it was nuking. Slushy snow and ice covered the highway as I and thousands of other weekend warriors white-knucked it up one of the most loved/hated stretches of highway in Colorado, Interstate 70. I-70 is a world-class mountain freeway, perhaps one of a kind. It’s also one of only two ways to reach the glorious powder stashes of Summit County from Denver, from which tens of thousands of skiers stream each weekend in search of the deep white. Passing beneath 14,000-foot peaks, you are likely to see bighorn sheep or mountain goats grazing along the side of the road. The views are stunning, with cliffs, rushing rivers, waterfalls, vast swaths of forest, and ridges cutting against a Colorado sky. The road goes high and then it goes underground, passing through the Eisenhower Tunnel. At 11,158 feet the passage — straight through a massive mountainside! — is the highest point on the Interstate Highway system and the longest mountain tunnel with nearly 2 miles of subterranean cement. Driving I-70 from Denver into the mountains on a busy day can be frustrating, to say the least. Frequent accidents, big trucks, and just way too many cars make the 67-mile drive from Denver to Silverthorne a real pain. Add a winter storm to the mix and the drive becomes downright hateful. 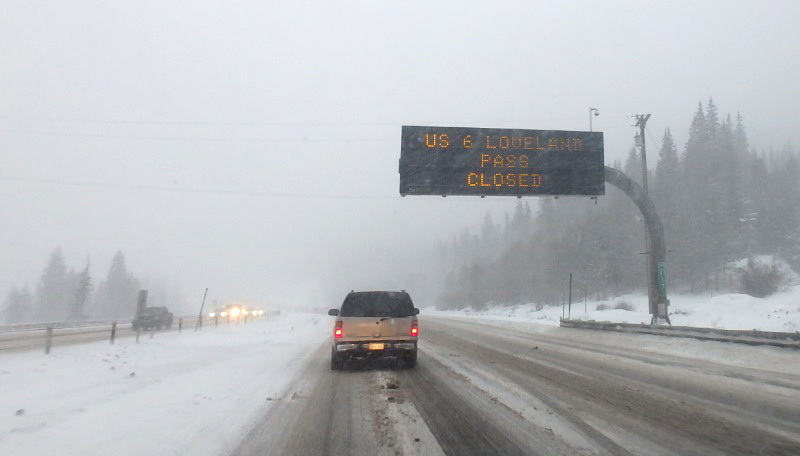 A normally 90-minute trip suddenly stretches to hours — as many as 8 HOURS to crawl along the freeway’s length on a busy and snowy day. Bad tires contribute to the chaos. 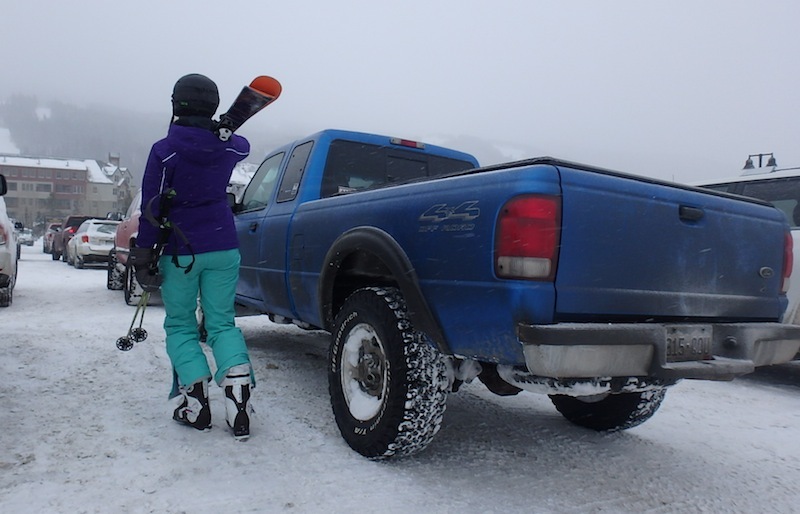 Indeed the Colorado DOT launched an initiative to more aggressively check motorists’ tires at ski resorts in Summit County. When combined with slick roads and heavy traffic, inappropriate tires are a recipe for disaster. 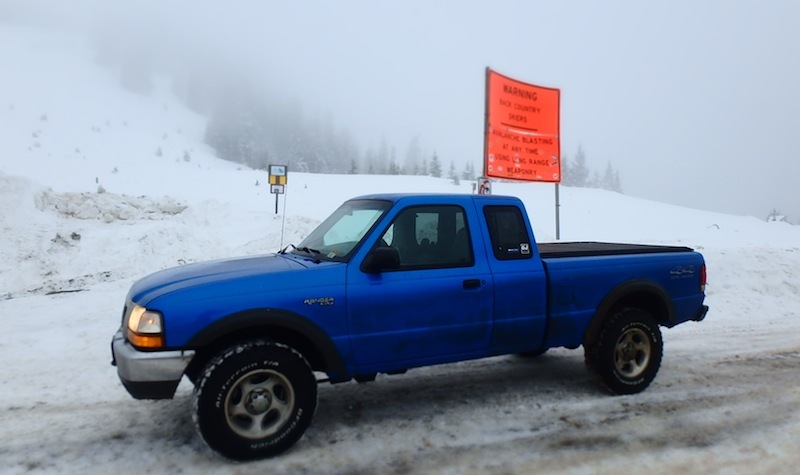 Warning signs flashed “Are Your Tires Ready?” over the slick highway as I steered into the storm and up the mountain. Mine were. On this particular December storm I was testing the new BFGoodrich T/A KO2 — an update of the cult classic T/A KO tire beloved by off-road enthusiasts for years. 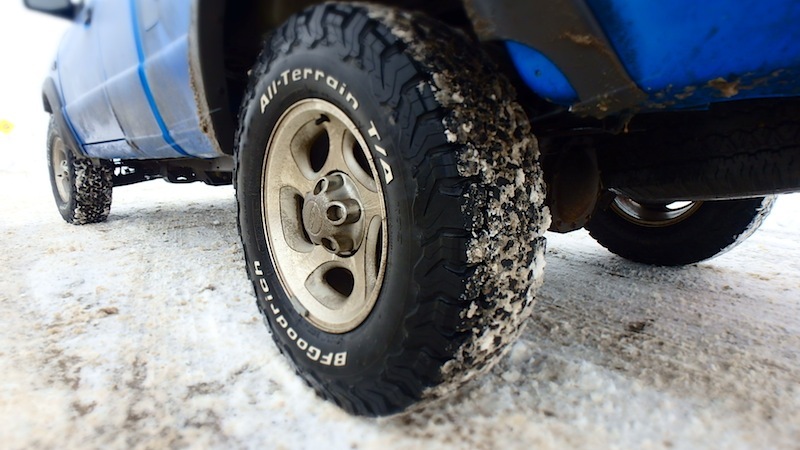 The T/A KO2 tires are rated for winter, with the “three peak mountain snowflake” symbol meaning they have been vetted for the task of driving on ice and snow. Undeniably, the T/A KO2 is a sweet tire, including beefy tread suited to off-road driving as serious as the Baja 1000 Race, but with a civilized temperament that added no road noise when I installed them on my truck before Christmas. Outside the cab of my Ford Ranger 4×4, all hell was breaking loose. 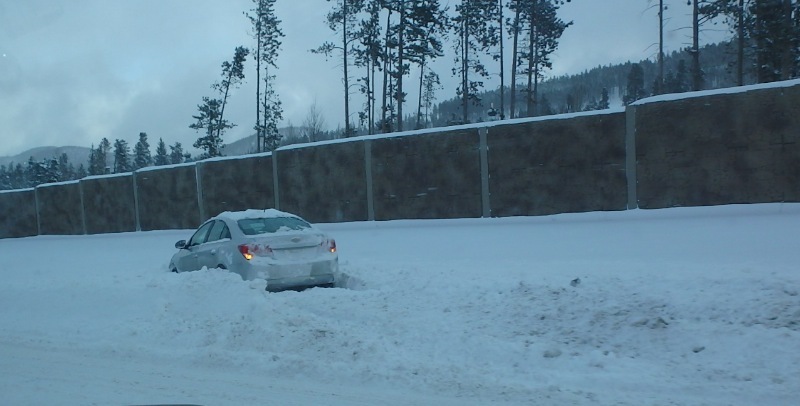 Small cars spun their summer tires in the right lane, unable to move up a steep incline as the highway approached the tunnel. Others sat hopeless in the ditch, awaiting a tow truck to extract them from their morass. 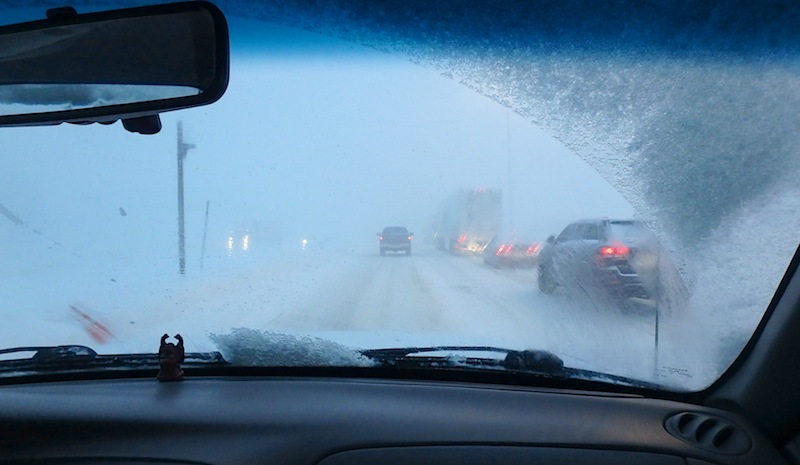 With 4-wheel drive engaged and aggressive rubber on the road, I easily crawled up the highway, accelerating comfortably to 30 miles per hour or more as traffic loosened. Soon, we were cruising through the Eisenhower–Johnson Memorial Tunnel and down the western side of the Continental Divide toward Silverthorne, Frisco, and Breckenridge. The remarkable Colorado attractions that draw thousands of summer visitors — long shuttered gold mines, hot springs, and ziplines — were just vague outlines through the howling storm. I am generally a cautious driver. I watch for traffic slowdowns ahead and try to keep a smooth pace. But as we got onto side roads, I pushed the pedal a little harder than I usually would in the snow. You know, for testing and science. As we rolled toward our abode for the night, I felt confident driving. I hit the brakes hard on a few open stretches of road with no traffic in sight, and the tires gripped the sloppy surface with ease. 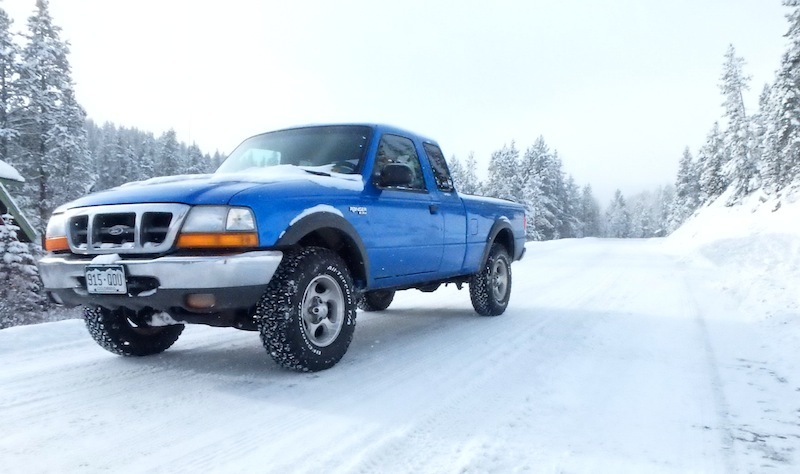 Driving my old Ranger in the storm was positively fun. If only everyone would get rid of those bald tires traffic would move a whole lot quicker. The next morning dawned crisp and cold. 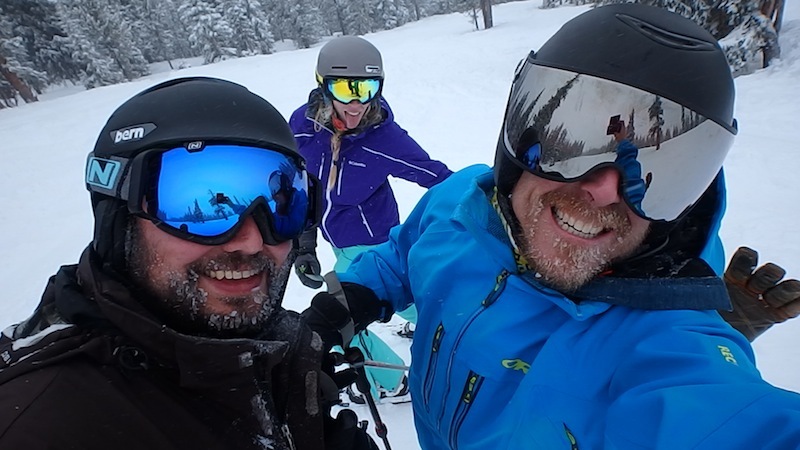 My wife and I rolled over to Keystone Mountain for some early turns. About 8 inches of fresh snow greeted us at the top of the Outback Express, and we enjoyed a long, quiet morning gliding silently through the trees. The snow was soft and fluffy and the lift lines non-existent. 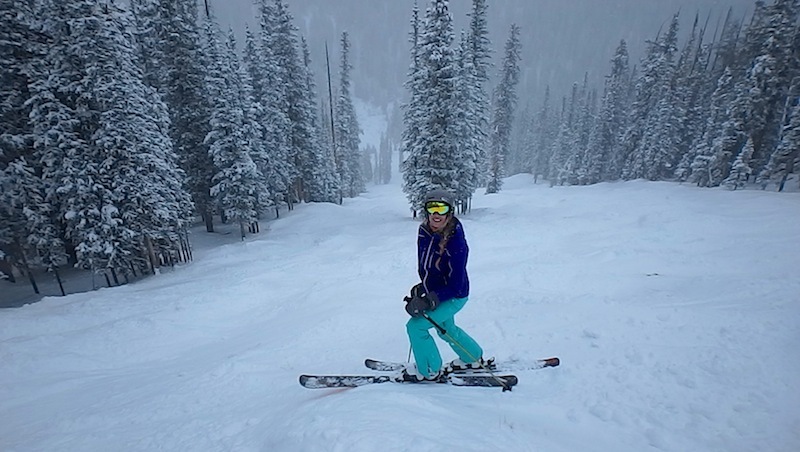 We lapped our favorite lift for a few hours, enjoying the spectacular conditions that make this part of Colorado so popular in the first place: Steep, deep and light-as-feathers powder through glades of evergreens. The wind picked up in the early afternoon as our legs tired. After a quick discussion on the lift, we decided to call it early to beat traffic out — and take the long way home. GearJunkie's "Real World Test" series, sponsored by BFGoodrich, covers adventures off-road and off the trail. See additional stories in the series, including "Ghost Town Road Trip," "Climbing A Giant," and "4x4 Roadtrip Up North." I-70 can be a nightmare, or it can be a pleasant and beautiful mountain drive. Which face you meet depends almost entirely on when you choose to drive it. Avoid the big rushes at all costs: Friday night and Saturday morning, as well as Sunday afternoons, tend to turn I-70 into a 50-mile parking lot. Need to get back to Denver on Sunday evening to be ready for work on Monday? Wait until after 8 or 9 p.m. and it's usually smooth sailing. For out-of-state visitors: Be aware that I-70 can take a LONG time to travel on a busy day, especially from the Denver airport. Trips to the airport often take much longer than anticipated. When you're skiing, if it's busy on the mountain, it'll likely be busy on the highway. Plan accordingly and either leave early or, better yet, schedule your arrival and departure in the middle of the week. Finally, there is but one other option, Highway 285, to reach the ski country of Summit County and beyond. While the drive through Fairplay, Alma, and Blue River on the way to Breckenridge is spectacular, it is two lanes and usually significantly slower, and longer, than I-70. Tools to ease the drive: goi70.com Real-time road info. I-70 is congestion-free the majority of the time, and with a little planning your drive can be uneventful and fast. 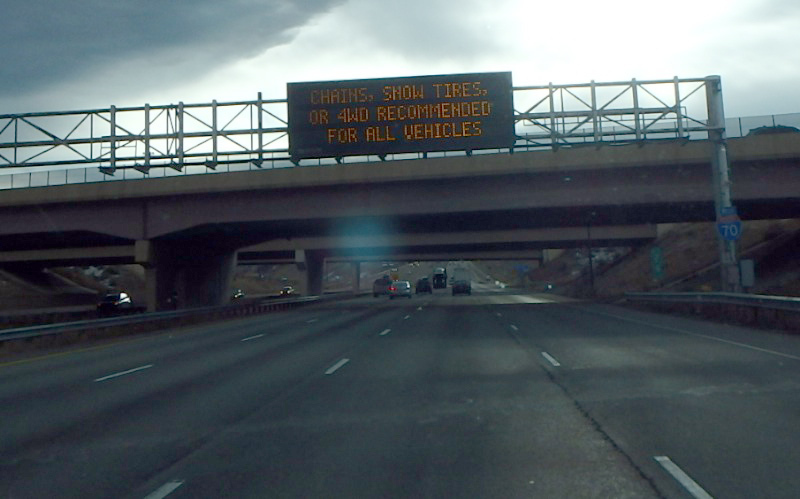 cotrip.org Traveler information for Colorado interstates and highways, including current road conditions, weather, and estimated travel times. codot.gov The Colorado Department of Transportation's (CDOT) online source for information on the I-70 Mountain Corridor. The Tires: BFGoodrich sponsored this article and we tested the brand's newly-released All-Terrain T/A KO2 tires. The wider footprint and aggressive tread was bomber on our I-70 test, including as mentioned in the story narrative as well as hundreds of additional miles in Colorado this winter already. Beyond snow, the K02 is a tough tire with great traction on gravel, dirt, rock, and mud. As an everyday tire they work well, too, and there is little extra noise despite the grip you get motoring on these able-treaded tires down the road.